Despite what you may have heard across much of the media snow is not guaranteed tonight (much like Tuesday when they last induced a frenzy) but Southeastern and Network Rail will introduce a revised timetable tomorrow. A light dusting will see a slightly revised timetable which is a Saturday service (on many Metro routes this is near identical to weekdays) and enhanced rush hour trains. So no big difference. If snow is heavier then services would be reduced and possibly run around every half an hour. As with any snowfall in London it’s often a big unknown until it’s imminent – and it’s not due until 7-8pm tonight. 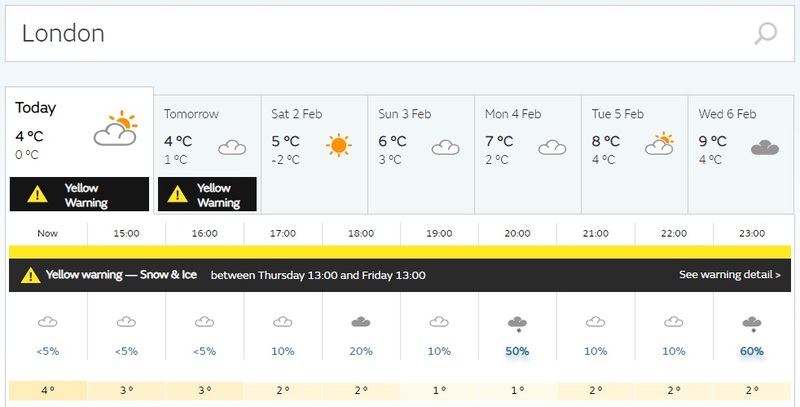 Models and Met Office live forecasts are still not sure (note: not apps which are very unreliable but videos uploaded to the Met Office site). You wouldn’t know that from the BBC, national and local press mind. Many are reporting amber warnings for London whilst a quick check two minutes ago actually shows yellow – the very lowest warning level. Of course that could all change. For my money it’s more likely than Tuesday night and lots of the south of England will see greater settling – but in London the heat effect could still play a part. All to play for.